Many issues can arise from working in an office, lifting weights, martial arts, driving, etc. Actually, pretty much any hobby or occupation that puts your body into forward-flexion for prolonged periods of time can potentially bring postural problems. 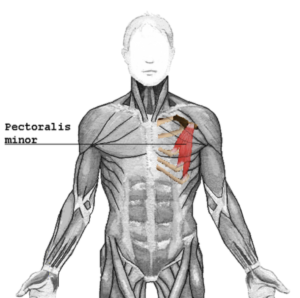 1 What is the Pec Minor? The pectoralis minor, or pec minor as it’s known for short, is a thin muscle that lies flat underneath the pectoralis major. As the name suggests, this muscle is the smaller of the two pectoral chest muscles. It has three origins within the ribs, extending from the third, fourth and fifth ones. At the other end, it connects to the shoulder blade on each side. The pec minor’s job is to provide mobility, stability, and flexibility to the scapula. The scapula is symmetrical bones found on the shoulder. There are two pectoralis minor muscles. The pectoralis minor muscle is not to be confused with the pectoralis major muscles, which are located just above. Their primary purpose is to facilitate movement of the shoulder joint itself. They are located horizontally across the chest area. So, how does the pec minor result in injury and discomfort, and how is it associated with Thoracic Outlet Syndrome? Firstly, let’s explain what Thoracic Outlet Syndrome, or TOS, is. Gary Fitzgerald of The Journal of the Canadian Chiropractic Association explains that a patient will experience TOS as a result of irritation of nerves as they travel from the lower end of the spine into the arm. When the pec minor is involved in this process, the patient can exhibit physical discomfort as a result. Typical symptoms associated with TOS include weakness, pain, muscle weakness, neck pain, headache, vertigo, chest pain, and dizziness. This condition is also often found in patients presenting cardiovascular issues, and will most commonly manifest as chest pain. Neck pain and headaches are the least likely symptoms to develop when TOS is associated with the minor pec muscle. TOS is related to both musculoskeletal and cardiovascular health conditions, so we recommend seeking professional advice if you’re experiencing any of the symptoms listed above. The pec minor is known as the king of compensation. This is because it will adjust accordingly to the body’s different postures and positions, often sacrificing its condition in the process. Neurokinetic Therapy explains that the minor pec muscle can become easily tight and shortened due to a number of external factors. These include a slumped shoulder posture, breathing and joint dysfunction, and a various range of compensation patterns. The pec minor is often inhibited by the fact that it’s located amongst a cluster of muscles in the shoulder area. Due to the poor biomechanics presented here, the pec minor can often be dysfunctional. 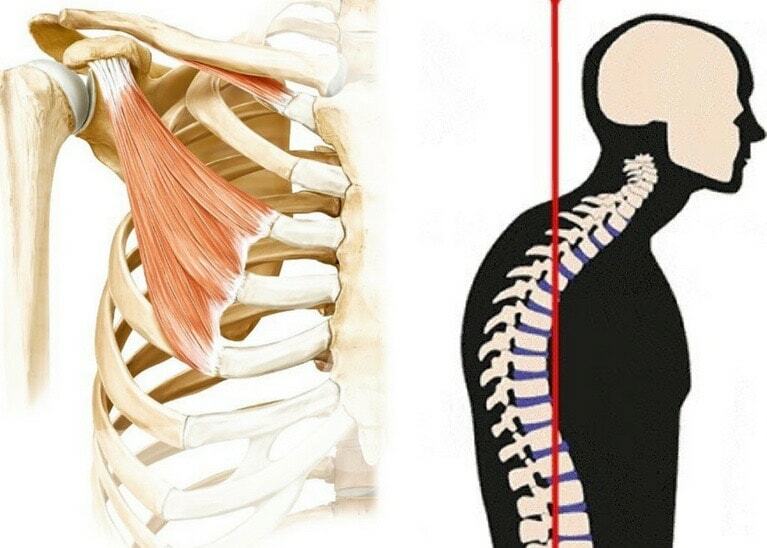 Having bad posture and a forward sitting head will result in the shortening of the pec minor. This is called protraction. 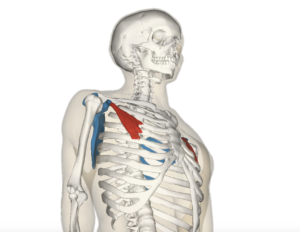 We’ve looked at the pec minor in relation to Thoracic Outlet Syndrome. So, what other complications can arise from issues with the pec minor? Heidi Dawson of Multi Briefs Exclusive says that the pec minor muscles determine much of your posture. This goes for good and bad posture. Heidi points out the type of lifestyle that can result in a contracted pec minor muscle. A lot of us have office jobs that keep us sitting down for long periods of time. Similarly, we drive cars and look at screens. All of these activities involve the back arched with the head forward, and shoulders slumped down. When you maintain this position for extended periods of time, the minor pec muscle tightens and remains that way. When you’ve got a pec minor that’s continuously contracting, and it’s overactive, this can result in subsequent shoulder injuries. The most commonly associated injury with an overactive pec minor muscle is pinching of the nerves. These nerves are located just below the shoulder. You will experience pain and discomfort with regular arm movement. An overactive pec minor muscle can also result in limited mobility and function of the scapula itself. The last common injury associated with the minor pec muscle is one that we’ve already discussed – Thoracic Outlet Syndrome. In fact, up to 50 percent of TOS cases can be traced back to the minor pec muscle, making it the most common cause of this condition. There are a number of effective treatments to help with this type of health condition. Painotopia explains that self-massage is a helpful treatment for issues with the minor pec muscle. To self-massage, the minor pec muscles, locate the tight and tender muscle tissue that needs massaging. Pressurize the tissue with your fingers by forming a shovel shape with your hand. With slow and short strokes, massage the tender muscle points. In order to save your massage hand from tiring, support it with your other hand. You may also recruit the help of a professional massage therapist to implement a good massage routine, should you feel that you’d rather have someone who knows what they’re doing. Another possible treatment solution for issues with minor pec muscles is stretching. Sophie Xie of Be My Healer discusses the options with stretching. The first stretch you can do in this circumstance is called the Door Stretch. Hold your hands above your head in a surrendering pose at a 90-degree angle against a doorway. Push against the frame of the doorway as if you’re trying to walk through it, holding this pose for 30 seconds. Once you’ve completed this stretch, raise your hands higher against the doorframe, so your elbows are parallel with your chin. Repeat the first stretch in this position. The second stretch that can help with your minor pec muscles is called the Sun Rise Stretch. Lie flat on a surface and bend your knees to the side. Bend your elbow in the same surrendering pose at 90 degrees to your body, lying it on the flat surface next to you. Move your body towards the side that your knees are bent into, keeping the opposite hand and arm lying on the floor. Hold this for anywhere between 30 and 90 seconds. It’s easy to do damage to the muscles located in your back and shoulders. With the type of lifestyle we often have, it can be near impossible to avoid this. The more you know about a condition, the better. If your symptoms align with this type of muscle issue, then hopefully these treatment options might help you experience some relief from the pain and discomfort.